Jointly developed and supported by SAP and Microsoft, Duet enables information workers to improve decision-making, increase process compliance and decrease costs by taking full advantage of SAP business processes and business intelligence through the Microsoft Office environment. This article provides a good basis for understanding the Duet architecture and how it connects with SAP. Duet software brings together the best of these industry leaders to provide information workers with an unprecedented level of information access. Duet brings to the desktop of every Microsoft Office user a comprehensive set of functionality from SAP applications. The following figure provides an overview of the software architecture. 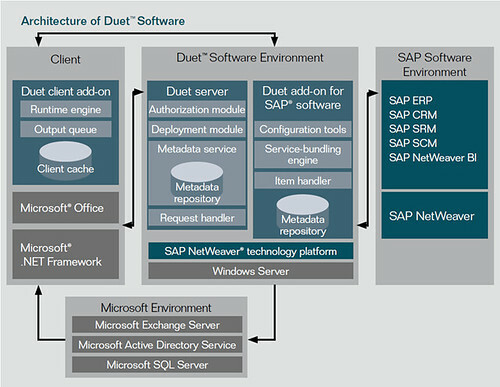 The architecture of the Duet add-on for SAP software leverages metadata storage in all Duet components to ensure that Duet delivers the user’s query response and the process logic, business rules, and configuration parameters resident in the SAP software. This ensures that there is no adverse impact on the underlying SAP software and no need to recreate the upper-level process logic. Deployment module - Automatically propagates the latest updates of the metadata and associated binaries and data references to client systems when updates are made. The deployment mechanism depends on how Duet defines the user’s role. The mechanism also deploys logic (Microsoft Office .NET components) and forms (Microsoft Office InfoPath forms and Windows Forms) to the client machines upon client request. Providing a Single Sign-on (SSO) experience for access to the backend SAP business processes, the Duet client is authenticated by the Duet Server using Windows authentication mechanisms (e.g. Active Directory, Kerberos, etc.) 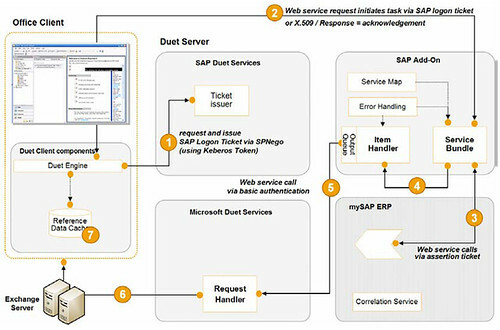 Once authenticated, the Duet Server uses the SAP NetWeaver infrastructure to provide the Duet client with a logon ticket. The Duet Client can then communicate directly with the backend SAP system, using a web service call to the Service Bundle, fulfilling the client request (e.g. submit a leave request). When data needs to be transferred to the client, the backend SAP system communicates with the Exchange Server using the Request Handler on the Duet Server (e.g. manager receives an approve / reject email for employee’s leave request). Implementing Duet takes an understanding of the various components involved and advance project preparation. Knowing what to avoid is sometimes as important as knowing what to do. From the experiences of early Duet implementations, best practices have been developed and delivered to customers to ensure ease of deployment. These best practices assist customers in moving from the implementation phase to quickly enjoying the Duet experience. Microsoft and SAP continue to jointly develop, deliver and support best-practices for global deployments of Duet. When implementing Duet in a Production environment, reliability and scalability are key concerns. The Duet architecture provides the flexibility to separate Microsoft and SAP components, allowing customers to scale each independently based on required workload. Based on best practices, it is recommended that the individual deployment of these components on separate platforms for production implementations. As an example, the Duet Microsoft components can be deployed into an existing IIS environment, using an existing SQL Server database to store the Duet Metadata. In addition, SAP’s Duet J2EE components can be installed onto a NetWeaver Java Web Application Server without affecting the backend ERP ABAP system. Because Duet employs a service-based architecture, no software installations or modifications are required on Microsoft Exchange Server. Similarly, Active Directory requires only that an account be created to facilitate a trusted sender from the Duet framework; in turn, this account must be configured using the SETSPN utility. No Active Directory schema changes need to occur, nor is there a need to change the OU structure.